Lunch and Brunch Cruises last Approximately 2 hours. 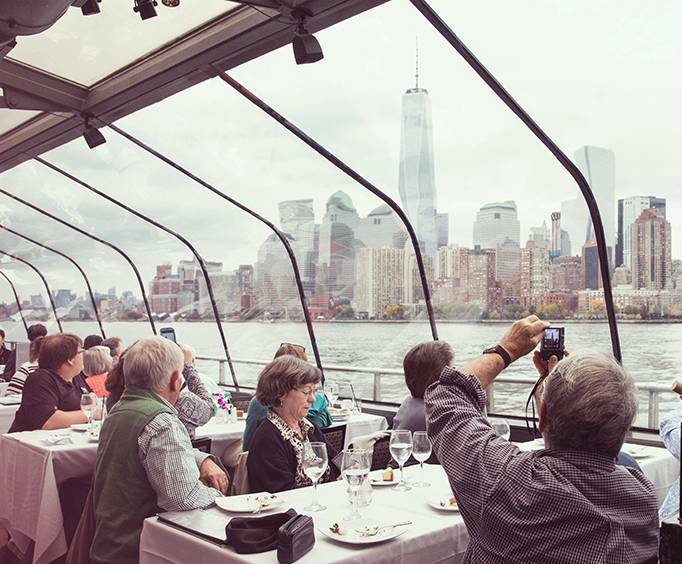 Spend an unforgettable day on the shores of New York City with the Bateaux New York Lunch & Dinner Cruises as you gently peruse the New York Harbor aboard an all-glass vessel. Spend quality time with family and friends while meeting new people and mingling with other New York visitors as you enjoy and elegant lunch or dinner cruise. You'll set off from Chelsea Piers on the west side of Manhattan as you take in the beautiful skyline of New York City and travel the Hudson past notable locations such as Ellis Island, the World Trade Center site, the Colgate Clock and the Statue of Liberty. Relax onboard with live jazz music, outstanding service and elegant dining that will leave you nothing short of satisfied. 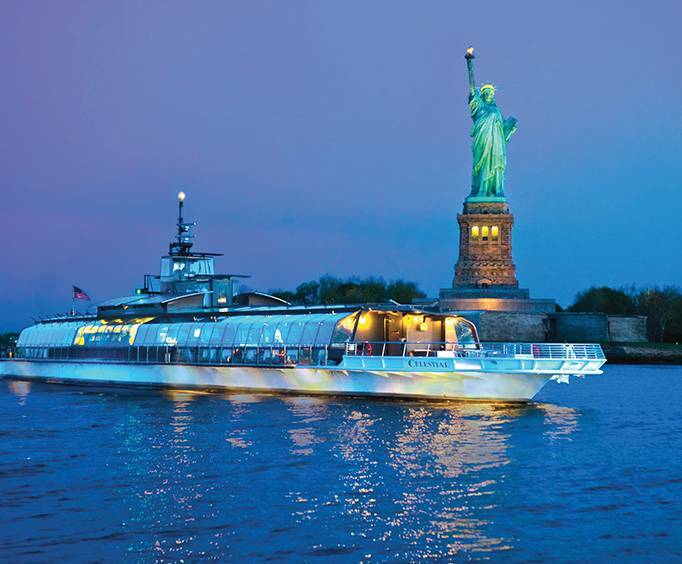 Whether you choose to wine and dine during the day as you ooh and ahh at the city scape across the water or board the vessel at night for an unmatchable display of city lights under the night sky, you're bound to have a one-of-a-kind experience with the Bateaux New York Lunch & Dinner Cruises. Dinner cruise attire is collared shirts for men (jackets requested). Appropriate dinner cruise attire for women includes cocktail wear, a dress or dressy casual clothing. Dark or dressy jeans are acceptable. For all other cruises, dressy casual attire is appropriate. Casual jeans, t-shirts, shorts, athletic shoes and flip flops are strongly discouraged on all cruises. 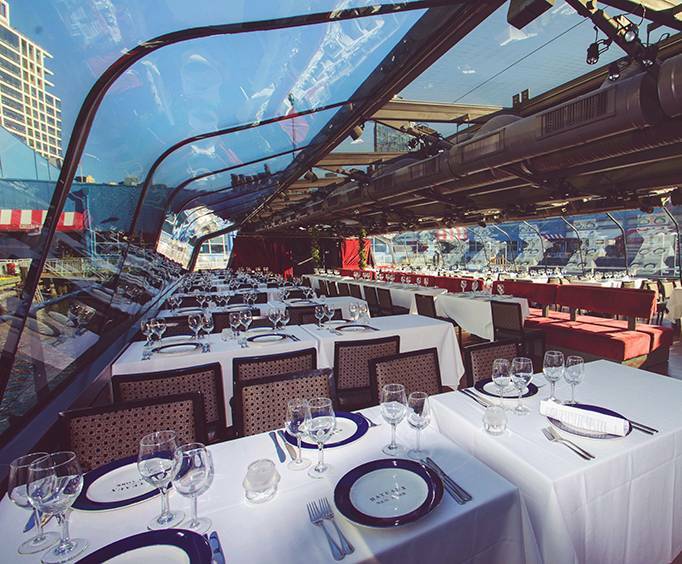 The Bateaux New York has tables for two, four, six, eight and even more. This stunning, European ship is encased in crystal clear glass for the most optimal sightseeing experience. Plush seating, cherry hardwood floors and linen-draped tables all make for exceptional comfort and elegance. With a capacity of 300, guests can enjoy an outdoor observation deck that boasts endless gorgeous views of the world famous New York City skyline. Colgate Clock: An impressive, octagonal clock facing that faces the Hudson River. It was built in 1924 and has a diameter of 50 feet. World Trade Center Site: Previously known as Ground Zero and former site of the World Trade Center which was destroyed on September 11, 2001. Battery Park City: A 92-acre community adjacent to Battery Park which is a 25-acre park named for the artillery batteries that were originally there to protect the settlement behind them that is New York City today. New Jersey Central Railroad Terminal: One of five passenger railroads on the Hudson River during the 19th and 20th centuries. It has been added to the New Jersey Register of Historic Places. Ellis Island: Home to the Museum of Immigration and also features the Ellis Island Immigrant Hospital on the south side of the island. Statue of Liberty: Historic monument that stands on Liberty Island in New York Harbor. It represents the Roman goddess of freedom and was a gift to the United States from France. Governor's Island: A 172-acre island that is home to Castle Williams, one of the forts built in the early 19th century to protect New York City from attack. South Street Seaport: A designated historic district featuring early 19th century restored buildings. Brooklyn Bridge: One of the oldest cable/suspension bridge in the United States. It measures 1,595.5 feet across. Brooklyn Heights: A prominent residential neighborhood in New York City. Manhattan Bridge: A suspension bridge with a total length of 1,470 feet. It connects Lower Manhattan and Brooklyn. Williamsburg Bridge: A suspension bridge that connects Manhattan and Brooklyn. Includes admission on the Bateaux New York Lunch Cruise. Includes admission on the Bateaux New York Brunch Cruise. Includes admission on the Bateaux New York Dinner Cruise.